Apple has model numbers for all their products. The original iPhone was iPhone 1,1. The iPhone 3G was iPhone 1,2. The current iPhone 4S is iPhone 4,1. The next iPhone will be iPhone 5,1. Likewise, the original iPad was iPad 1,1. The iPad 2 was iPad 2,1. And the new iPad is iPad 3,1. The Retina MacBook Pro is MacBookPro 10,1. Following pre-production code names, that's how Apple classifies things internally. Within models, there are variants. The iPhone 3G was a radio variant of the original iPhone 1,1 but was fairly similar otherwise, hence iPhone 1,2. The iPhone 3GS got a whole new chipset, so also got a new, model bump to 2,1. Likewise, the iPad 2 was a leap ahead of the original, so it got iPad 2,1. At least the Wi-Fi version did. The GSM/AT&T version got iPad 2,2 and the CDMA/Verizon version got iPad 2,3. When Apple updated the internals again this spring for the newer, lower cost version, that variant was iPad 2,4.
iPad 2,5 has been showing up in developer logs for months and iPad 2,6 was noted yesterday by Marco Arment on Marco.org. So what are they? Marco thinks they may be the iPad mini. Since we've already seen that Apple doesn't consider something like a boost in radio technology from 2G/EDGE (iPhone 1,1 -- the original iPhone) to 3G/HSPA (iPhone 1,2 -- the iPhone 3G) to be worth a full model number increment, but they do consider the switch from an Apple A4 chipset (iPhone 3,1 -- the iPhone 4) to an Apple A5 chipset (iPhone 4,1 -- the iPhone 4S) to be increment worthy. Marco's thinking seems to be, given the iPad mini will likely use all the components of the iPad 2, only shrunken down -- something iMore reported on back in May -- that Apple might just keep using the iPad 2 model series as well. iPad 2,5 would then be the iPad mini Wi-Fi, with 2,6 being AT&T/GSM, and theoretically we'd also see 2,7 for Verizon/CDMA, and perhaps other models for other regional radios. So where does that leave 4G LTE networking? The iPad 2 doesn't currently include a 4G LTE radio the way the iPad 3 does. Would Apple stick to the same HSPA+ and CDMA radios in the existing iPad 2? Not necessarily. We've already seen that Apple doesn't increment models a full number just for radio changes. So, if Apple is shrinking down the iPad 2 internals and re-packaging them into the relatively narrower iPad mini case, they could easily include LTE for both AT&T/GSM and Verizon in their respective models. And they could likely do so using the same newer, better Qualcomm 28nm MDM9615 chip that's expected to hit the iPhone 5 this September, and perhaps more products soon thereafter. 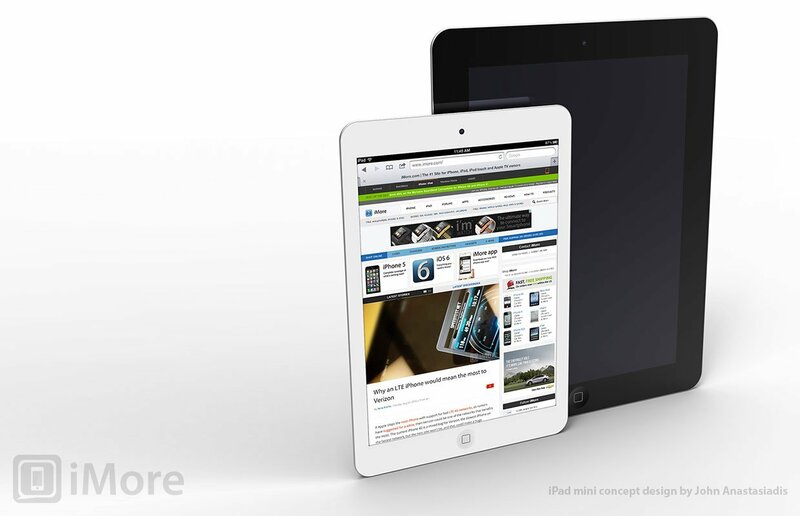 Would Apple really launch an entirely new product in the iPad mini as part of the year-old iPad 2 model line? Wouldn't an all new iPadmini 1,1, 1,2, 1,3, etc. be cleaner and less confusing? These are Apple internal designations that consumers can only find by clicking their way deep into product information inspectors. That means Apple will do whatever is cleaner and less confusing for them not for us.